Although nocturnal, bed bugs may feed in the daytime if there is no available food source at night. Bed bugs must feed in order for it to develop into the next stage of adulthood. They feed every 7-14 days. Bed bugs are attracted to the CO2 emitted while mammals sleep or rest. 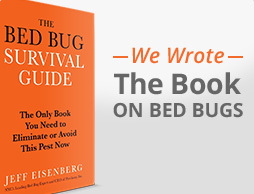 Bed bugs can lay 5-10 eggs per day. The eggs take approximately 6-10 days after being left by the female to hatch. The adult bed bug hides in cracks and crevices of your bed & or furniture. Adult bed bugs can fit easily inside openings as thin as a credit card. Nymphs are even thinner. Once fed, they are longer and plump until they begin to digest the blood meal. Adult bed bugs can live without a blood meal for up to 18 months and will wander to find a new host when one is unavailable.